A massive forest fire broke out in Theog just outside the city of Shimla on Monday. The fire was so fierce that the surrounding areas were engulfed in a thick blanket of smoke, with several villagers living in the area complaining of difficulty in breathing. The fire blazed for several hours but unfortunately the Municipal Corporation(MC) of Shimla had no water to put out the blaze and the state government had to send out a request for IAF choppers who lifted water from the Gobind Sagar dam in Punjab to douse the flames. Gagan Verma, a business man who heads a large Voltas outlet in the state and who travels between Shimla and Solan on a daily basis pointed out, "When I was driving through that smoke, after having crossed the Sankat Mochan temple located just outside the city, I though this is apocalypse now. I thought, once I reached Solan, the situation would ease. Imagine, my horror when I reached Baddi in Solan to find it engulfed in another major fire. Planting pine trees has been a major mistake by the forest department. Dry pine leaves are extremely combustible especially when the state does not have the water to douse these fires." Water has turned out to be the Achilles heel of a city that has proudly worn the sobriquet of 'Queen of Hill Stations' for over a century. The Shimla of today is reeling under an unprecedented water shortage, which has adversely affected its tourist industry for this season. Anil Walia, managing director and owner of Himland Hotels in Shimla pointed out, "We wait the whole year for the month of June to arrive because this is the time when tourism booms. This year, I do not even have 50 percent occupancy and business is down in a major way. Obviously, people have shifted to Manali, Mussorie and Naini Tal. Why will they opt to visit us when we are facing a water shortage ?" Walia ruminates, "Shimla city runs on tourism. When tourists do not come here in the month of June then everyone is hit. The taxi drivers, the restaurant owners, the shop keepers on the mall, even the ghora wallahs. Our earnings have nose dived." Walia feels the entire situation was grossly mismanaged by the state government, which did nothing to counter the bad publicity that had been generated by the present water crisis. "Hill stations face a chronic water shortage. It is there in Mussorie, Naini Tal and Ranikhet. Shimla is also known to face a water shortage which gets exacerbated during the summer months. The reason is not difficult to find. The city was built for a carrying capacity of 25,000 people. Today, we have two lakh people living here and we have another one lakh tourists during the season. So, it is natural that we will run short of water." Walia goes on to point out, "The majority of the 800 hotels in this city have never depended on the Municipal Corporation for their water supply. We depend entirely on tanker water and continue to buy tanker water throughout the year. 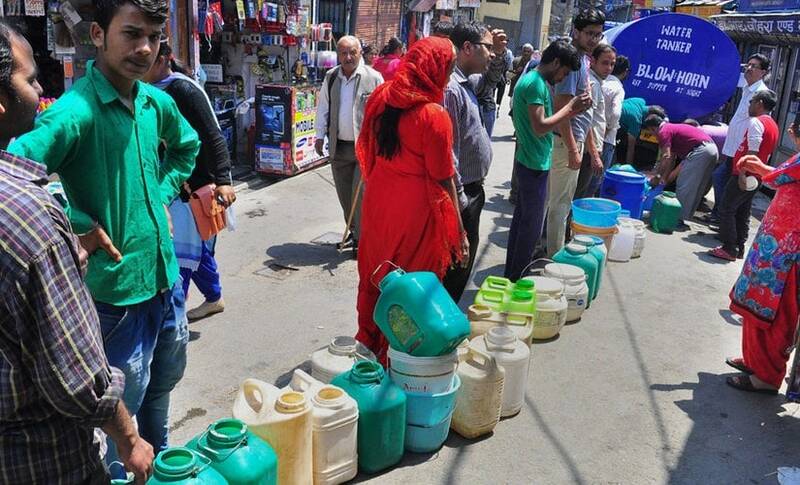 Shimla actually faced three days of acute water shortage (18, 19, and 20 May) and the media blew this out of all proportions." However, many residents contradict Walia's observations as they point out that in many homes, especially in the Kasumpti locality, the situation was so dire that they were getting water once in twelve days. "The crisis started from 18 May. Our area has been one of the worst hit probably because a large number of multi-storeyed commercial and residential buildings are located here," said Kokil Sharma, a mother of three children. "Once the taps went dry, all we have done is run around from one bawari to another (natural source of water) to collect water in 20-litre plastic containers. Just lifting these containers to our second floor flat every day was a major achievement because we have no domestic help," said Sharma. It was almost a fortnight into the crisis that the municipal corporation sent a tanker in their area. Even though the water situation was extreme, the mayor of Shimla, Kusum Sadret chose to go on a fortnight's junket to China during this very period. Facing increasing criticism, chief minister Jairam Thakur began chairing daily meetings in the state secretariat on how to tackle the water crisis. The serpentine queues of people standing next to even longer lines of buckets sent out a message about an unhappy city, especially since on some occasions, people even resorted to fist fights over water. Kirti Gupta who lives in Lower Kaithu area says, "How do they expect old people, especially widows to cope with this crisis. Surely, the government should have stepped in and made some special provisions for old people." Traditionally Shimla drew its water supply from five main sources. These were Gumma, Giri, Ashwini Khad, Churat and Seog. The city's daily demand of water is around 45 MLD but with 50 percent of water being lost in leakages, both at the pumping and distribution stages, the city receives much less water than its requirement. But the worst damage that could have been done to the city was to build a sewage treatment plant in Malyaa which was 5 kilometre upstream to Ashwini Khud from where the city used to source 25 percent of its water supply. This is a criminal act because the result has seen an increasing spread of hepatitis which resulted in the death of several local residents in 2016. The other problem of course is the massive amounts of deforestation which have taken place across the entire Himachal and Uttarakhand belt where old natural forests have been cut in huge numbers. This has affected rainfall patterns and the last winter did not see a single snowfall except when it rained in the month of March. "What our mountains need is snow and not more rain in winter because rainfall comes in torrents and cannot be stored. Snow melts gradually and ensures greater retention of water and this forms part of the natural water ecosystem, said Vikram Soni a professor at Jawahar Lal Nehru university who works on water issues. The water crisis saw residents react in different ways. Many people sent out an appeal through social media asking tourists not to visit the city till such time as the water situation eased. Walia found that difficult to accept. He said, "I can understand the high court here giving a directive against according preferential treatment to VIPS including ministers, bureaucrats and judges. But the public to say so is unacceptable. As it is ,we have been hit hard by homestays. We hoteliers have calculated that over 2000 beds are being given out every day in this manner. But people providing these services are not paying commercial rates for electricity and water whereas we are paying double what they pay. Then to have residents send out these appeals is unprecedented," Walia added. Meanwhile, both the Congress and BJP have joined hands to demand the sacking of mayor Kusum Sadret. One of the few BJP councilors to defend her is Kiran Bawa who said, "The China tour was government sponsored. Over 168 mayors from around the country were to visit China with the program having been planned in March." A number of road-rokos have also been organized by angry citizens during the crisis. One such bid to block traffic as the means of protest was organized last week by Anjali Verma, a homemaker, in Barlowganj last week. The angry mob stopped vehicles on the main National Highway 22 for three hours. Senior police officers had to come down to persuade them to let the traffic resume and the public relented only when they were given an assurance that a tanker would be sent to Barlowganj the next day. But the problem in Shimla is that tankers cannot reach a majority of homes and therefore people are dependent on piped water to meet their needs. Water is now being given to residents every fifth day and that too for a period of one hour. Given the scarcity of this precious natural resource, Shimla residents have reconciled themselves to a dry summer ahead of them.